It is commonly thought, and asserted in the Meejah, that a Bishop is obliged to submit his resignation when he has completed his seventy fifth year of age. What Canon 401 (1) requires is that the Bishop rogatur [is asked] ut renuntiationem ab officio exhibeat Summo Pontifici. This is based upon Christus Dominus  of Vatican II, which is vaguer; without mentioning any particular age, it merely says that when the bishop has become less capable of fulfilling his duties properly because of age or some other serious reason, he is asked to offer his resignation. Christus Dominus does put an adverb before rogatur: enixe [earmestly]. Canon 401divides the requirement into two halves: (1) the Bishop who has reached his 75th birthday is asked to submit his resignation; (2) the bishop who is ill and weak or has another gravem causam is earnestly asked to submit his resignation. You are probably wondering ... no; the 1917 Code has no comparable provisions. Canon 401 makes the request stronger if the bishop is old, ill, or weak, than it is if he has merely reached a specific age. rogatur, without the enixe, is not a particularly powerful word. English translations of the Conciliar documents and of the Code of Canon Law usually translate it as requested. Before the Council, most bishops, like the popes, died of old age in possesssion of their sees (having been given a coadjutor if they had become particularly frail). This would respond to the old conviction that a bishop was wedded to his Church and would be an adulterer if he were translated to another See. The twentieth century provisions forget all this and treat the post as if it were a matter of efficiency and competence, like being a supermarket manager. Having a spot of trouble doing the job? Out you go! Good sales returns? Excellent! Have a bigger shop or become regional manager! In my view, this is untraditional and, I would go so far as to say, corrupt. This decision taking away the right of voting in the papal election from a whole category of cardinals, is an enormous decision. Until now, the most important part of their function was this right. It commands and effects their beheading in the most accurate sense of this word; they keep their hats, but their heads are chopped off. This is what the ancient Romans called diminutio capitis, a lessening or amputation of their civil rights and, of course, of their personality. Let us not forget that the statute creating the cardinals’ right to elect the Pope dates back to the year 1059; that during the arduous course of this thousand-year period of history this rule was never questioned; that the “impediment” of advanced age has never prevented the creation of a cardinal or the continuing of a Pope once he became 80 years old, that it is contrary to the Catholic spirit and the Roman Tradition to suspend a law supported by such a time-honored custom without most grave reasons; and that this type of change, affected by the Pope in 1970 in such a sudden, personal, and suspicious way, will increase most people’s feelings of insecurity, instability, and the alienation which as contributed to de-sacralizing the Church and loosening its customs. Let us forget the inhuman, vain, vile aspects of this decision concerning the age of men whose sacerdotal ordination had separated them from mortal mankind as far as powers and dignities are concerned. 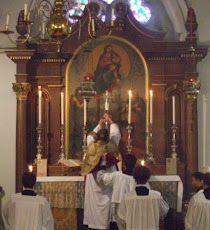 After this blow and all the others of the past five years designed to naturalize and laicize the clergy, how could one have the heart to keep on telling the ordained young priests: ”7u es sacerdos in aeternum secundum ordinem Melchisedech ? This all being over, today’s priest is just like an official who, in due course, is “retired,” with a life pension, like a Swiss guard. There are several reasons why he may have made the decision- ABS thinks it was because it gave him the opportunity to get rid of Cardinals of a Traditional bent and replace them with Cardinals sympathetic to the revolution within the form of Catholicism. In any event, at the time the Church had opened itself up to the world and, so it began to ape the world in its ideas and as ideas have consequences we get such things as forced retirements and Pope Benedict's retirement because he was tired and had reduced energy, just like a CEO of a major corporation. Was this opening up to the world a wide or prudent decision? Well, has the world become more christian or has the church become more worldly? The English church has been moving bishops at least since 619, when St Mellitus was translated to Canterbury from London. But I agree that it should not be a common practice. If I recall correctly +Michael Bowen described being moved from Arundel & Brighton as akin to a divorce. It would be a wonderful thing if a bishop will ever test whether the auto-resignation at 75 is nothing stronger than recent custom and practice. Francis would perhaps not be wholly cheerful if a bishop decided to test Maximum Leader by not offering his resignation on the perfectly reasonably grounds that his health is good. There have been too many instances under Francis where a good bishop offers his resignation at 75 and is immediately replaced by someone terrible. Interesting that almost the same words (enixe commendatur) are used to exhort priests to celebrate Mass daily (CIC 1983/can. 904). It’s now a hopeless mire. Would anyone here like to see Daneels still in Brussels? Kasper in the next conclave? Mahony still in Los Angeles? This is a gun they loaded for their own protection which has blown off a few of their own toes. The only way out is for a pope of thirty years to appoint an orthodox episcopate. We’re stuck.